Sapulpa Historic Preservation Commisssion 10 North Poplar Sapulpa, Oklahoma The home of Dr. Harry R. Haas and his wife Rose. 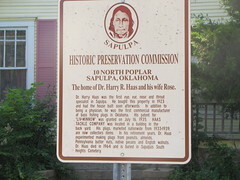 Dr. Harry Haas was the first eye, ear, nose, and throat specialist in Sapulpa. He bought this property in 1923 and had the house build soon safterwards. In addition to being a physician, he was the first commercial manufacturer of bass fishing plugs in Oklahoma. His patent for "LIV-MINNOW" was granted on July 16, 1935. HASS TACKLE COMPANY was located in a building in the back yard. His plugs, marketed nationwide from 1933-1939, are now collectors items. In his retirement years, Dr. Haas experimented making plugs from peanuts, almonds, Pennsylvania butter nuts, natice pecans and English walnuts. 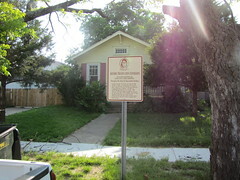 Dr. Haas died in 1964 and is buried in Sapulpa's South Hights Cemetery.